For your enjoyment, here are links to Pah Bah weekend photos. Many thanks to Ben and Noah Puggarana for their beautiful photography! Pah Bah 2018 was a fun and happy event! 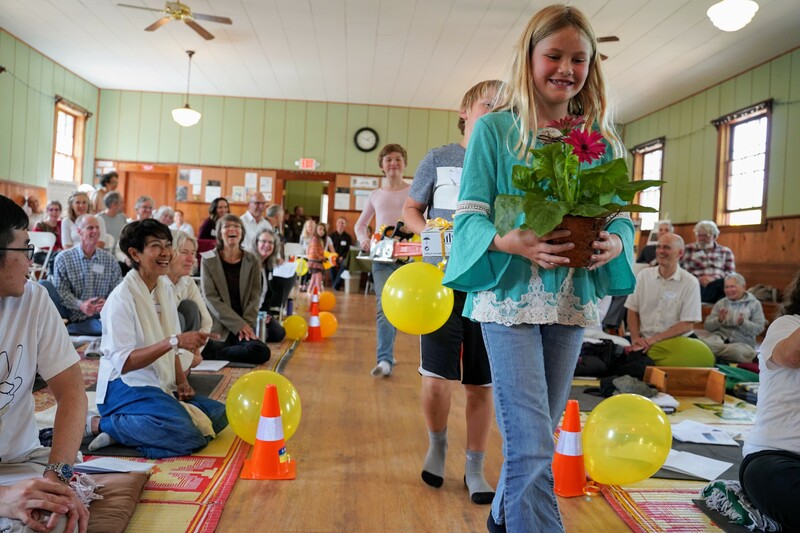 The kids stole the show again this year with balloons and bearing wonderful gifts from Portland Friends of the Dhamma. Thank you PFoD friends. The power tools are greatly appreciated! The Pah Bah was very much a family affair as epitomized by our sponsors Swee, Chek and son Kyson Tan. Their extended family traveled from Malaysia to come with them to the Pah Bah! The family is pictured here on a Hermitage walking meditation path. Swee, Chek and Kyson live in Vancouver BC, Canada. 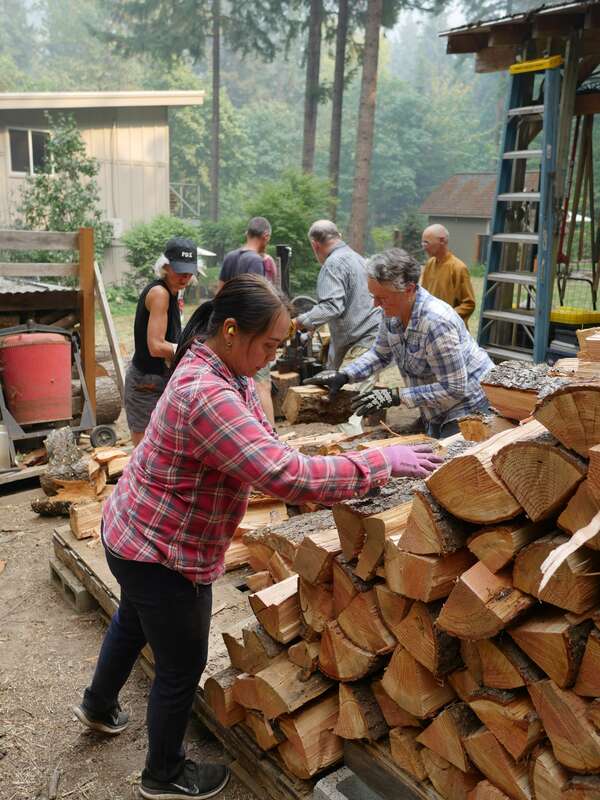 They first heard about the Pacific Hermitage at Birken Forest Monastery, when our own Tandin (Elena Smith) was there on retreat and invited them to last year’s Pah Bah. Not only did they come, they asked to sponsor this year’s Pah Bah. Many thanks to the Tans! 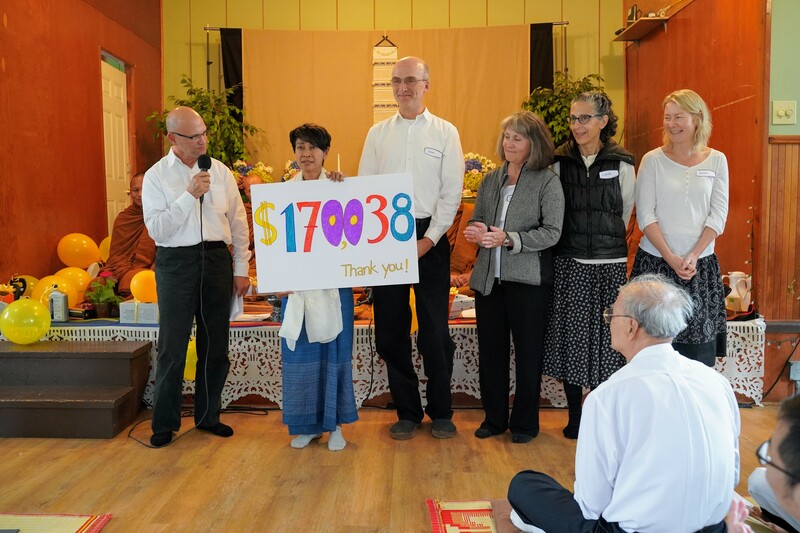 Photo: Sanghata unveils the unbelievable generosity of our friends, who contributed over $170,000. It will be put to good use to help build the abbot’s kuti and other important projects, like protecting the seclusion so important to monastic practice. Thank you for such generous support! A name like that requires an explanation! It’s a two-day garden party (last of the year) to cut, split and stack wood for heating the house. *Please tell the meal dana coordinator if you’re bringing food. 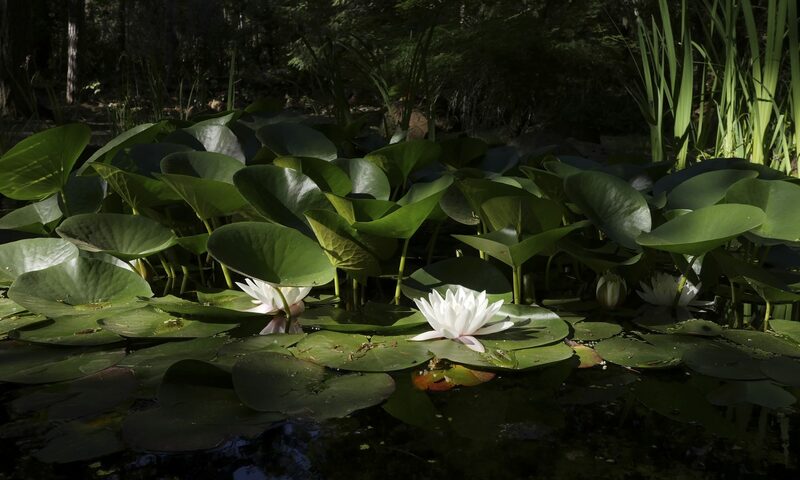 OCTOBER 13: Half Day of Meditation with the Monks, White Salmon, 1-5 pm, at Yoga Samadhi. Walking and sitting meditation. Brief dhamma talk. Cushions & chairs available. OCTOBER 19 & 20 — Monks at Portland Friends of the Dhamma (PFoD) Friday evening and Saturday through mid-day. Check the PFoD website for specifics. OCTOBER 21 — Monks at Hillsboro Meditation Hall. More information here. TUESDAY NIGHT SITS — Community Meditation, 6:30 – 8:00 pm, at Yoga Samadhi, White Salmon, WA. Cushions & chairs available. 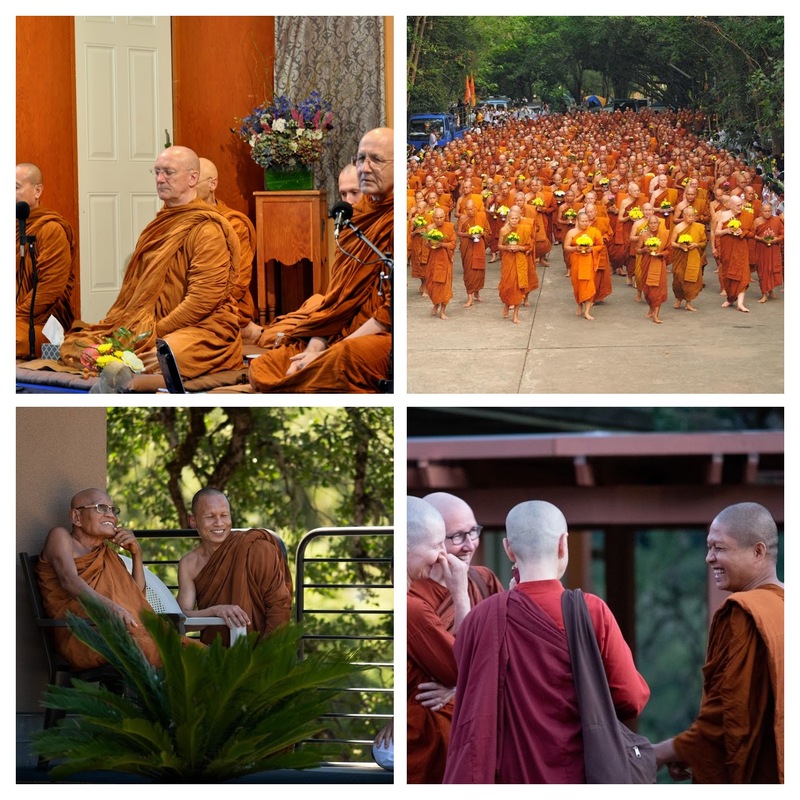 With the Abhayagiri Kathina coming up and our Pah Bah just over, it’s a great time to shine a spotlight on a lovely aspect of this tradition — how monastics from the Ajahn Chah monasteries support and interact with one another. Whether it’s senior monastics attending our Pah Bah, hundreds gathering to honor Luang Por Chah, or monks and nuns helping Abhayagiri celebrate the opening of their new hall, monastics from around the world travel to honor and support one another’s monasteries. Each Ajahn Chah monastery is its own entity, a place for monastic practice and a base of support for lay community practice. Each one exists only if there is enough local support to sustain it. At the same time, each monastery is part of a larger whole — a family of monasteries. Ajahn Chah monasteries intentionally cultivate, nurture and support relationships among their monastics. This is evident in how Ajahn Sudanto warmly refers to his fellow monks as “brothers.” The time he spends with them enriches and supports his practice and his role at the Hermitage. The family aspect is obvious when you see how many monastics from around the world meet and gather to honor one another’s ceremonies, to share information, or to work through administrative discussions. You’ll also see monks training at several different monasteries, further connecting them with more than one Sangha. Once in a while, one monastery may even offer monetary support to another. 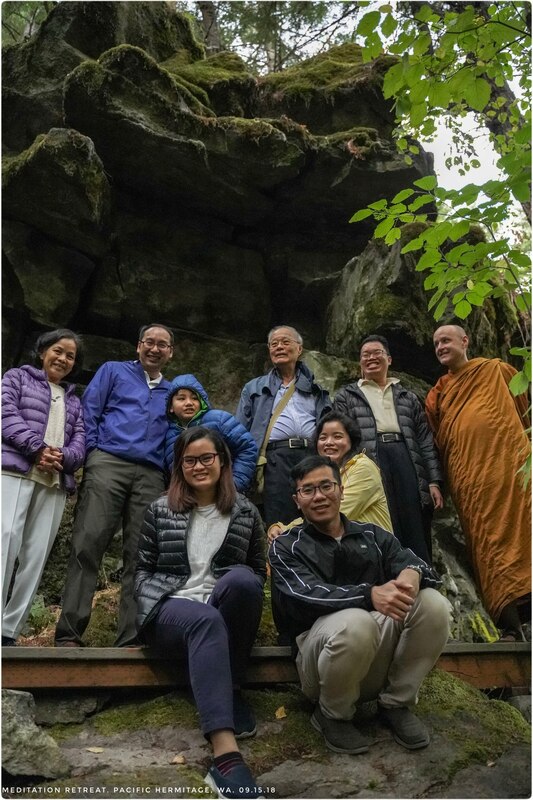 As Scott Benge, President of Sanghata, says, “It’s kind of sweet, really, the way the monasteries of this tradition help one another.” And, as a lay community, we are fortunate beneficiaries — we’ve received Dhamma reflections from even the most senior monks and nuns of this tradition. In 2010, probably before most of us even knew about the Hermitage, beloved monks from around the world celebrated the brand new Pacific Hermitage. They are shown below paying their respects to Luang Por Sumedho at the first Hermitage location, on Tunnel Road, in the hills above White Salmon. Venerable Suddhiko returns to Abhayagiri October 24. Ajahn Sudanto and Ajahn Kassapo also leave October 24 to attend the Abhayagiri Kathina. They return after the meal on November 2. Ajahn Kassapo will remain at the Hermitage through the Winter Retreat. He’ll be joined by Venerable Kovilo (from Abhayagiri) in late November. Reminder: Pah Bah is Sept. 15 & 16! Join the monks and lay community for a Saturday meditation retreat, or the Pah Bah on Sunday, or both! Everyone is welcome — old friends and new. 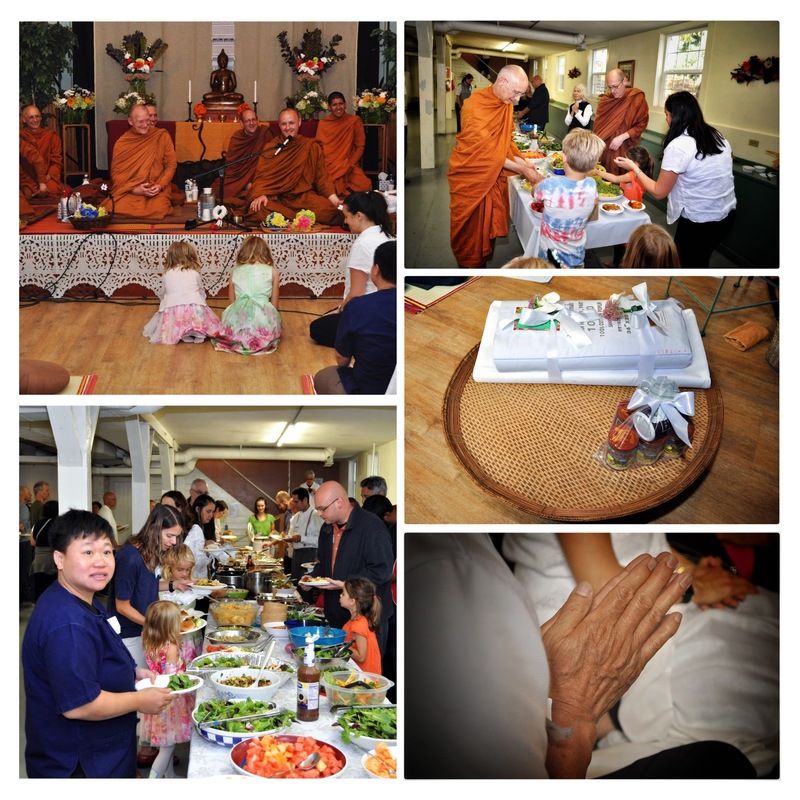 September 16: Pah Bah — meal offering / potluck, children’s program, chanting, ceremony of offering robe cloth and needed material goods, Dhamma talk.